I’ve push the last couple days of changes to the CityGrid WordPress Directory and Search Plugins. I’m working to make the WordPress Plugins billable by default, so all you have to do is install, activate, plug in your publisher code and submit to our partner account management team. Even with this push we aren’t 100% there yet. I will compare my demo WordPress sites to my checklist and submit them for review. The partner account management team will give me feedback on anything I left before I can be approved as billable, and start sharing revenue from “Places that Pay”. Your WordPress installation should notify you of the update to the plugin, all you have to do is install it. The tracker will start providing more analytics about the traffic and interactions between your site visitors and the places you are displaying from CityGrid, which is available in your dashboard once billable. I will run down my billable checklist tomorrow, and submit my demo sites for review. Once I hear back I will blog abou the results. 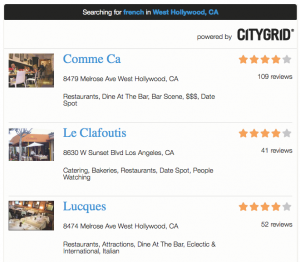 I pushed an update for the CityGrid WordPress Directory Plugin earlier today. I finished porting over the changes to the CityGrid WordPress Search Plugin as well. Both my WordPress plugins had a pretty basic look and feel, I wanted them to look better. So using the HTML and CSS template I borrowed from CityGrid I added it to both of the CityGrid WordPress Plugins to make them look sharper. So now both the CityGrid WordPress Directory Plugin and CityGrid WordPress Search Plugin have a default UI template, as well as the ability to switch it and make it look like CityGrid.com. Next I’m going to add another template or two, then start extending the functionality of each template, allowing WordPress site owners to have as much flexibility when deploying business search or directories using CityGrid Places API. 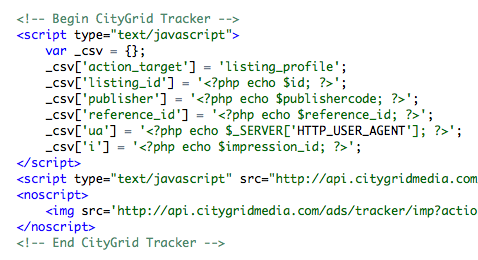 I just pushed an update for the CityGrid WordPress Directory Plugin. The WordPress Plugin lets any WordPress site owner to launch a business directory for their site, allowing them to choose the business categories they wish to display. 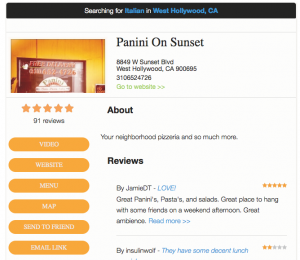 For example, if you want to show pizza, burgers, seafood and chinese food in your neighborhood you can launch the plugin, choose your categories, enter your city, neighborhood or zip code and it automatically adds a directory to your menu with the categories you wish to display. The plugin has been around for a month, but it had a pretty basic look and feel, I wanted it to look better. Last week took the HTML and CSS template for CityGrid, cleaned it up and turned it into a template for any developer to use when deploying a local web directory. I want my WordPress users to take advantage of this, so this week I added it to the CityGrid WordPress Directory Plugin. While doing this I also added a framework, allowing users to choose from multiple templates, meaning I will be adding more UI templates in the future. I am almost done, adding the same template to the CityGrid WordPress Local Search Plugin today and committing the changes for everyone to take advantage of.